it was an amazing first experience with an Italian cruise line. My highlight was the entertainment and the staff politeness and helpfulness. They were so friendly and always gave us good service. The spa treatments were amazing! Definitely pampered to the max! If you are American then do not do this one, the agent her name id Haley is ignorant and have not taken a cruise in her life, she was bragging about this cruise as the most luxurious and special. The food in the open buffet is the same every day and the restaurant was ok but the waiters were not friendly and would not give you what you want unless you tip them every day. Communications were a bit a problem, I remember Costa Concordia and understood the confusion and the chaos that followed the sinking of the ship back in 2012. Shows and music very cheap and low quality. One of the ports; Napoli we stayed only 5 hours which was too short to see a city. 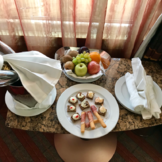 The cleaners in the room were sloppy; imagine that I found in the ice bucket a rotten apple that they forgot to check and clean before our arrival. You call and ask for thing but they ignore you. DO NOT DO COSTA, and if your agent is HAYLEY WILLIAMS from price line do not listen to her she is classless. Costa review is nice and we had a high expectation when we book our cruise. English language should be the principal communication on board. Anouncement over the shipboard communication system sometimes never transmitted in english. We are force to join the Italians, Spanish, French or Germans in our excursions because no English speaking groups. I've been on more than 20 cruises and I would rate this as one of all-time worst cruises. The food was absolutely terrible. Luckily we have a sense of humor and our table-mates also had a good sense of humor. We sent our food back almost every night. It became a joke - which food will we send back tonight. Getting off the ship where we tendered was so disorganized. We only had a few hours in the most beautiful ports in the world and we spent most of the time waiting for our tender number to be called. Costa really needs to improve on getting passengers off the ship in a timely fashion so that people can enjoy and explore the beautiful cities. What a shame that we spent most of our time waiting. I don't know why we stopped at Bari, Italy. I think spending more time in Mykonos or Santorini would have been much more interesting. We took a shore excursion in Santorini and I plan to ask for a refund. We tendered in and then took a bus ride to the beach. We spent 2 hours at the beach, with a drink ticket for juice or coffee. No soda, wine, or beer or even food for the price of the excursion. The bus took us back to the town (according to the excursion for shopping) where we waited in line for two hours for the cable car ride to catch the tender back to the ship. Total waste of time. We were the last ones back on the ship. I'm not sure that they would have left without us had we not made the cable car ride in time. We had a good time with our friends and made the cruise the best experience possible. But it was not because of the ship or Costa's organization - it was friends and family. I hope Costa listens to feedback from their customers. They have so much to improve on. This cruise was not my first time on a costa cruise. This one was not all what I remembered of Costa..
From the quality of food, to the service, a real nightmare. Our room was about the only thing that had not changed much . We talked to other guest, all had the same reaction, a very disappointing cruise. It was way too big and difficult for English speaking guests. Of the 4000 guests fewer than 300 were English speaking. This made participating in the on board events difficult. There was no advance preparation for any excursion. No history or what to see was given. The push was to take the excursions they offered which were very costly. The food was attractively presented but lacked taste. The staff was generally helpful but were unable to give personal service. My luggage was lost and they did provide me with some essentials but did not follow up on locating my luggage very well. This was the worst cruise I have ever taken. The ports were great but the ship was terrible. I did not like the food they served and the service they provided was not up to par. It took 12 hrs just for someone to fix my toilet. The entertainment they provided was not interesting. Wish they had more to do on the ship. I spoke with other passengers and they said that they did not enjoy this cruise either. They cruise other cruise lines and said this one was the worst. If your only wanting to see the ports then this is for you. I did love the ports but a couple of times they were late getting this set up so that took away time in the ports. Check in was a nightmare, everything was disorganized. I sailed on the Costa Fascinosa in December 2017 from Spain to Brazil. This was my first experience with Costa. I travelled with my husband and we are both on our 30s. This was our fourth cruise. Overall: we would cruise with Costa again since we enjoyed our holiday. Pros: 1. The shore excursions were cheaper than other cruise lines so we booked directly from Costa. I couldn't really see a difference in quality either. 2. Great atmosphere! Our boat had a good mix of ages. There was something for everyone. 3. Our cabin steward was so kind and attentive. I saw her daily. She would stop for a chat and would even pick up conversations where we left off. Cons: 1. I adore Italian food but found the buffet sections to be the same everyday. The food was a good quality though. 2. I asked a few questions at the customer service desk and was given the response 'well, I don't know' or 'maybe'. I've gotten the response of 'I don't know but I'll have someone who does contact you' from other cruise lines. 3. There was a wide variety of nationalities on the boat. That is not at all a negative! But, this does make on-board activities tough since all instructions have to be repeated five times. I often found it easier to just speak to fellow passengers in Spanish or French. My husband also speaks German so he could do things in English or German. Your English speaking tour may get cancelled if it doesn't have enough participants to get the go ahead. So, if you do speak another European language, you'll be able to join that tour. Most people on our boat spoke Italian or Spanish. Please feel free to send me a message if you have a specific question. I'm more than happy to help! The experience on this fascinating ship is at highest level! The best part were the animators who were making the greatest show ever and were the spirit of the party, and the theater where the dancers never stopped amazing us. I would recommend improvements when it comes to the restaurant Gatopardo. The serving is waaaaayyyyy toooooo slow!!!!!!!!! I love Italian culture, so needless to say I was very pleased to be immersed into it for a whole week! The ship was fantastic. The staff was so helpful 24/7 and so friendly. Pro tip: My family and I flew in a few days prior to our sail date and I think it helped so much. The time change from the US to Spain was only 6 hours but I really think if we didn't have those 3 days prior, the cruise would not have gone as well as it did. We had an amazing week, the food was delicious, and the staff were helpful and kind. The entertainment was fun and the shows were spectacular. I would go again in this ship because it was amazing. The cabin was quite small but we booked an Inside Premium cabin. The restaurant was fantastic. In the buffet area we had a lot of choices and the food was delicious. The service was good. This was the first time with Costa and it was amazing. 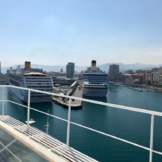 Although initially excited about our first Mediterranean cruise holiday with Costa our trip soon turned into a nightmare. When we went down to our room our cases were there but only 1 key, but didn’t think anything of it. Later that night around 10pm we got a call and the person hung up when we answered it. The Costa staff then said they would get back to us which they never did, when we chased them they just said they were looking into it, all the way up to the end of the holiday. They just couldn’t have cared less which makes me think this is a regular occurrence. When we got home we contacted Costa and got the same response, ‘looking into it’ then no reply. There are plenty of cruise lines to choose from, don’t waste your money and precious holiday time on Costa you’ll regret it !!! I cruise average 2 times a year and this was our 10th cruise, but our opinion about this cruise is terrible, first the food was terrible, staff around the ship was not friendly at all, we used to see at in other lines when you met any crew member they always say hello, ask you if everything is ok, not in this one . At the restaurant our server never asked if everything was ok, if we needed something else, even when we ask for any recomendation about the options in the menu, nothing he was just taking order. The cabin too small (it was not surprise because this was not our first time at Costa cruise) but the cabin attendant was terrible: first the bed sheets seems like never was washed, dust everywhere,"no comment". At the self serving restaurant if you were looking for something and you ask they said "is in the other side" and you go to the other side and ask, obviously, the answer was "is in the other side". so you have to desist because is a never-ending story. One day the lunch ( should be open until 1:30 pm ) at 1:10 the only available food was bread, and we were waitting standing there for 20 minutes (long line of people) and they said , sorry but is 1:30 pm and the lunch time is over. You can imagine what happened after. The ports visited were ok but the time in each port was extremely short, you have no time for shopping. 3 or 4 hours is not enough at europe. Other cruises lines are 8 -10 hours, while costa 3 - 5. Between 1:30pm to 7:00pm the only food available was bread and thin pizzas (inedible). Nights life were fantastic, singers, piano, excellent. The ship was beautiful. The crew was very nice\, but quite serious. 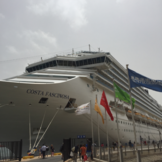 I sailed on another costa cruise and it was awesome\, fun\, relaxed and easy going. This cruise seemed more serious\, a little boring\, and nothing special like my last costa cruise. Also\, the food on my lat cruise was spectacular \, this cruise was sub par.